Maybe I’m putting the cart before the horse, or in this case the goats before the silvopasture, but we are looking to expand our homestead adventures by purchasing a gorgeous farm on 53 acres. The place we have our eyes on is perfect in every way. A lovely pond, an old pole barn in incredible shape, mountain views, and a whopping 53 acres. It’s got this 1/4 acre girl’s head spinning. The only thing it doesn’t have is pasture. That’s fine for the goats I already have, but it simply doesn’t work for my dreams of fiber sheep and a guard llama named Kuzco. With a technique called silvopasture, I might just be able to make this work. To put it simply, you create a pasture between quality trees. In some cases this involves planting trees on pasture land, allowing enough light through the canopy to allow forage to grow. In my case it would mean clearing out enough space between the trees for pasture to grow to accommodate my future grazers. The concept was originally created with cattle in mind, but it can be used for all sorts of farm species. I think the hardy appetites of my Nigerians can handle the challenge. Silvopasture can be arranged in rows or clumps, or they can be more free-spirited. Rows are good for large-scale production of timber and animal products. Clumps are good for establishing a new silvopasture in an existing field/open pasture. Because we are planning (optimistically) to be working with an existing forest, we will be selecting the best tree specimens — having a minimum spacing of 10′ between trees — and protecting those select trees. Since the forest is well established, the larger trees that have not been selected will need to be cut down for firewood. After the large trees are removed, a temporary fence will be put up and the goats released. The timing for rotation is based on a lot of factors. The general consensus is that you need to watch your animals and how they are interacting with the area you are running them. If you see they are determined to access your protected trees, it’s time to move them. Try to plan to spread forage seeds a week before rotating the animals out. Their activity will incorporate the seeds into the soil to improve germination. The best part of this system is that there are multiple benefits. I dare say this is a permaculture process. That’s something I love about our homesteading journey. Our time on 1/4 acre has taught us the importance of everything working together. You can seriously cut down your feed costs for browsers (llamas, goats) by providing loads of free forage. You also save some feed costs with your grazers (cattle, sheep) because a silvopasture does not need to be reseeded as often as a traditional pasture. In fact, silvopastures tend to seed themselves because the soil is protected and kept moist during even the driest seasons. Micro climates between the trees provide shelter for the animals from extreme elements. Be it rain, snow, strong winds, or oppressive sun and heat, the animals have protection. I’ve talked a bit about enrichment in the past and I feel silvopasture adds an element of enrichment in your livestock’s lives. Standing around in a clear pasture with a round bale or hay manger is all well and good, but I bet the goats would prefer to nibble on variety and play “king of the mountain” on rocks and fallen trees. Manure is an obvious benefit to the forest floor. Goats, sheep, and cattle all produce ready-to-use manure that provides nutrients to the pasture as well as the trees. Beyond that, the clearing of brush allows the trees to flourish without competition. It also reduces the likelihood of fires. This piece barely scratches the surface in regards to silvopasturing. Here is some great information from people who are actively using this principle or have conducted studies on the matter. This seems to the ultimate guide and it has photos. The photos provided are gorgeous and show you how much potential is in a setup like this. I’d feel like I was in a fairy tale walking through those pastures. I’ve saved it on my computer to reference throughout the process. This guide talks about water and fencing. It’s written for cattle, but it covers the needs of sheep and goats as well. 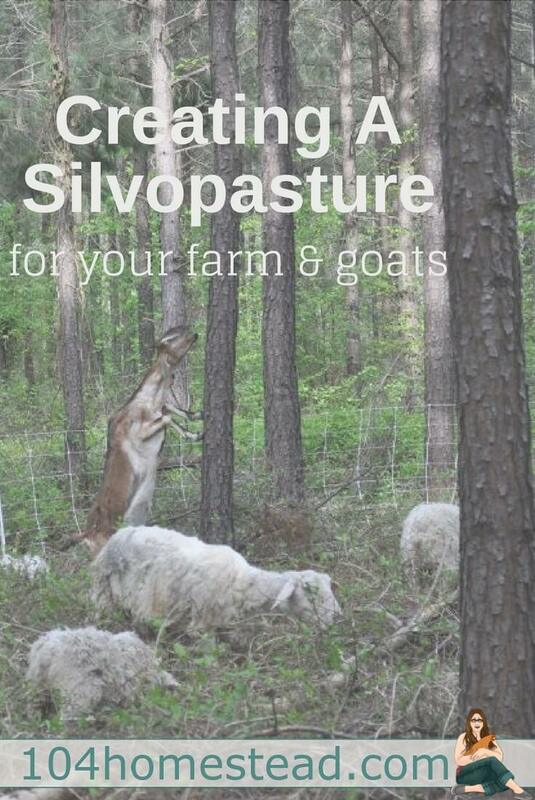 As for books, Silvopasture: A Guide to Managing Grazing Animals, Forage Crops, and Trees in a Temperate Farm Ecosystem isn’t coming out until June 2018, but you can pre-order (I did). The Woodland Homestead and Farming the Woods aren’t just on the topic of silvopasture, but still contain some great information. I think I’ll be buying both when I’m sure the seller is going to accept our offer. Exciting times for you with the new farm! Interesting post I have not heard of silvopasture before it’s great to learn about other ways to raise and feed browsing livestock. I’m designing a permaculture chicken yard with a food forest and silvopasture is going to be something I will learn more about for bigger livestock to see if some of the principles can apply in smaller settings too. Thank you for sharing this! 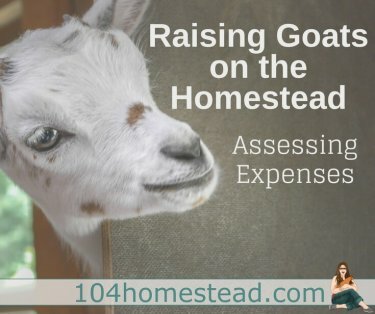 Neat post, we’re thinking about getting goats. We have 5 acres with some trees, so it’s an interesting perspective to think about not clearing everything away before fencing it in. I will be excited to get the goats to attack the blackberries in any case! Thanks for sharing those excellent links too, that guide is gorgeous! So excting! We live on 1/4 acre as well. I am always searching for a large chunk of land, but I haven’t found any in our budget. We live in an expensive area. I hope it works out for you! Good luck! !